Old furniture in a warehouse. The definition of a warehouse is a place where goods are stored. 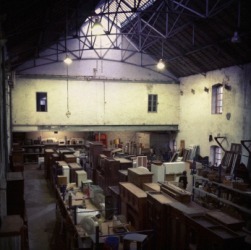 An example of a warehouse is a place where furniture is kept for a furniture company. To warehouse is to store, or to place a patient in a large institution with minimal medical, educational or social services. An example of to warehouse is to put a severely mentally ill person in a large institution that provides minimal psychiatric services. "warehouse." YourDictionary, n.d. Web. 18 April 2019. <https://www.yourdictionary.com/WAREHOUSE>. a building where wares, or goods, are stored, as before distribution to retailers, or are kept in reserve, in bond, etc. A place in which goods or merchandise are stored; a storehouse. A large, usually wholesale shop. To place or store in a warehouse, especially in a bonded or government warehouse. The lanterns hanging from the warehouse ceiling were all lit. Immortals and death-dealers battled the remaining demons at the warehouse-sized storage facility where the demons had been gathering the human dead.